Isaac Rosenberg may be remembered as a Jewish-English poet, or a poet of war, but his poetry stretches beyond those narrow categories. Since Rosenberg was only twenty-eight when he died, most critics have tended to treat his corpus as a promising but flawed start, and they wonder if he would have become a great poet had he lived. 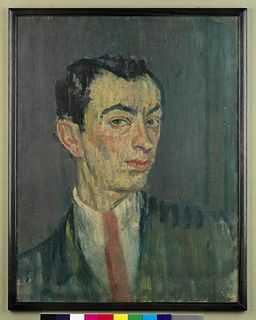 Rosenberg’s status as an English poet is thus still debated: he was a Jewish poet, he was an English poet; he was a war poet, he was a painter-poet; he was a young poet; he was a great poet and a minor poet. In his brief career, Rosenberg created a small selection of poems and a great many questions. “Break of Day in the Trenches” is, I think, a masterful poem, and the poem of Rosenberg’s featured today; his other poems aren’t to be missed, though. For example, his bleak humor breaks loose in “Louse Hunting,” and “Dead Man’s Dump” is sheer visceral horror in a poem. Poppies, associated with sleep and death, are the symbol of this war in particular; people in the UK, Canada, Australia, and New Zealand still wear the poppy on Armistice Day, or Remembrance Day as it’s known there, or Veterans Day, as it’s known here (the stars of Harry Potter attended at least one premiere with the red-orange flowers pinned to their clothes), and sometimes for the days in November leading up to the 11th. You’ll notice here in the United States that around patriotic holidays the VFW hands out “Buddy” poppies in thanks for contributions to its veterans’ assistance programs. I’m so happy to be getting to know these young men that I have never heard of before, but should have. This poem was beautiful and haunting. Thank you. This is a fantastic review. I hadn’t heard of Isaac Rosenberg either but this review does him justice and Break of Day in the Trenches is a poignant poem. Incidentally I love poppies and have some salmon pink ones on my kitchen table this week. I did not know they were associated in this way with WWI. Thanks, Denise! I like poppies, too. In his “The Great War and Modern Memory” — the 1975 book that first gave the World War I poets the attention they deserved — Paul Fussell called this the greatest single poem the war produced. You can definitely see how Rosenberg’s background as a painter influenced his descriptive style. You mention “Dead Man’s Dump” (which incidentally exists in a couple of versions); at the end of that poem, Rosenberg switches perspective rapidly between the speaker on the wagon and the dying soldier whose face is grazed by its wheel and who sees “The quivering-bellied mules” above him. Also, if you like “Louse Hunting,” check out “The Immortals,” in which Rosenberg frames dealing with lice in heroic language, which has the effect of making the idea of the heroic in the context of World War I absurd. In my view, “Returning, We Hear the Larks” is one of his best poems. The sensory description is powerfully evocative. It ends with a couple of wonderful similes. It shows how war perverts the Romantic ideal of communing with nature. And not least, it’s a rebuttal to John McCrae’s “In Flanders Fields” — the most popular poem of the war, which most of the real trench-soldiers loathed — with its “bravely singing” larks. I’m aware of Fussell’s book (I wrote my undergraduate thesis on the literature of World War I) and the Rosenberg poems you mention; this one, too, with its poppy white with the dust is a rejoinder to McCrae’s poem and its poppies. In an earlier post I juxtaposed Owen’s “Dulce et Decorum Est” with Brooks’s “The Solider” (not an original pairing, I know), and perhaps I should have done the same with McCrae’s poem here. Your point about the Romantic ideal is excellent,and were I to teach the war poets again, I’d love to place some earlier poems in conversation with them. Which pairings would you recommend?